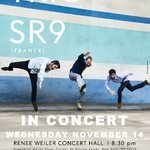 SR9 Trio is a french group promoting a creative vision of percussion : transcriptions for 3 marimbas, works commissioned and young audience shows. 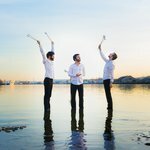 SR9 Trio (short for " Square Root of 9 ") was founded in 2010 by Paul Changarnier, Nicolas Cousin and Alexandre Esperet, who all earned First Prizes in the percussion class of the Lyons National Music Conservatory. SR9 Trio won Luxembourg International Competition (First Prize, Press Prize and Audience Prize) in 2012, as well as the FNAPEC 2012 Competition. They have also be invited to perform at the PASIC 2017 in Indianapolis, USA. This group promotes a creative vision of percussions with transcriptions for 3 marimbas of emblematic scores (Bach, Mendelssohn, Ravel, Stravinsky). This group also participates actively in the evolution of the contemporary repertoire of percussion through commissioning of works to young composers such as François Tashdjian and Florent Caron-Darras. 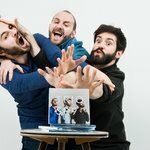 SR9 Trio gave 200 concerts in places such as Collège des Bernardins (Paris-France), Parc Floral de Paris (France), Opera de Lyon (France), L'Européen (Paris-France), Festival de la Chaise-Dieu (France), Festival de Menton (France), the Boston Institute of Contemporary Art (USA), St Peter’s Church in New York (USA), Theaterhaus in Stuttgart (G), the MIM in Brussels (B), Muziekgebouw in Eindhoven (NL), Drumworld Festival in Thorn (NL), The Piano in Christchurch (New Zealand) and International Festival of Canberra (Australia). 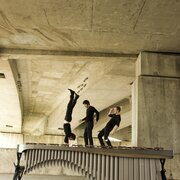 SR9 Trio released two CD : « Bach with marimba « in 2015 (Naïve Label) and " Alors, on danse ? " in 2018 (Naïve Label).